Are you stressed out and tired, but can’t seem to find the time to unwind? You are not alone. Many Australians also go through this. Fortunately, relaxation is something you can have in the comfort of your own home. Set up a home spa and create a soothing ambiance for it. With a home spa, you can relax any time that best suits you—whether you just got home from work or it’s your rest day. Having one will also help you save money and time in traveling to spas. With a home spa, you can find an easy way out of stress. With people’s busy schedule nowadays, it is becoming hard to find time to unwind. You don’t want to spend an hour or two just to get to the nearest hotel where there is a spa. So you would rather forget about it. However, taking care of yourself is something you should not take for granted. Home spas are trendy nowadays. They can help you easily relax after a long day at work. If you have already established a place to unwind in the comfort of your home, here are some ways to create a soothing ambiance that go perfect with it. If you have plenty of things you don’t often use which are just accumulating dirt in your bathroom, now is the time to tidy them up and put them in storage. Make your place even more relaxing by decluttering. This would free up space for additional accessories you are going to add to your home spa. Once you’ve tidied up your place, prepare your home spa to achieve warm and inviting ambiance. It all starts with the right choice of colour and lighting. You can put in relaxing colours in your home spa which include blue, light green, white, grey, or lavender. If you decide to set up your home spa in your bathroom, you will have to work with the usual colours of white and grey which are also ideal for unwinding. They also complement a traditional lighting solution which represents ultimate relaxation: candlelight. The illumination given off by candles has proven to have calming effects, and it is not just for festivities. If you want a soothing lighting effect for your home spa, start by kindling some coloured candles. Imagine having a dip in a comfy blow up spa, with music in the background and a healthy fruit shake in your hand. What a perfect way to soothe your senses. Music and sound in the background impact your relaxation, and choosing the right one is essential to clear your mind off things. Which music exactly are you supposed to listen to when relaxing? It is recommended that you listen to instrumental music. 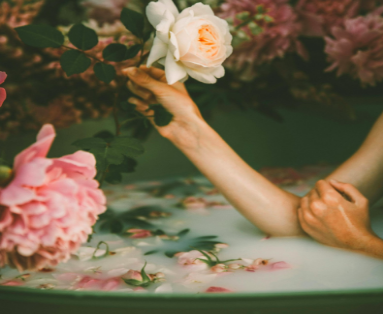 Any music that does not bring about any jarring thoughts is a perfect addition for a relaxing home spa, as it empties your mind of any stress. It simply gets you in the zone. If you prefer quiet surroundings, you should go with what you think better soothes you. Do you have a favourite scent—perhaps a bouquet of flowers or a certain air freshener? If you do, they are a great inclusion for a relaxing ambiance. If you’re seeking a more spa-like smell, this is something achievable. Scents are powerful in terms of provoking your emotions and memories. Scents induce relaxation and will be important addition to your home spa. Such ideal scents include chamomile, jasmine, blossom, vanilla, peppermint, and lavender. These scents can also be released together with lighting, through the use of aromatherapy candles. Aromatherapy is beneficial to your health, as its scents are obtained from essential oils. Nature is both stunning and relaxing, and adding a touch of nature in your home spa makes your place welcoming and soothing. Add plants and flowers to your home spa. Succulents, cacti, aloe plant, or whatever floats your boat will do. They make a lovely display and they can refresh the air as well. If you are the kind of person who mostly stays indoors, more oxygen through these plants are beneficial to your health. After creating a soothing ambience in your home spa, do not forget to pamper yourself with spa soaps and condition your hair with coconut oil. Add drops of essential oil into your shower gel as well. Then cleanse yourself from the grime of a long day at work. For the final touch, this is applicable if you have someone at home. You could certainly use a good massage. This will prepare you for a peaceful night’s sleep. Thanks to the soothing power of your home spa, you can now inhale, exhale, and relax. Whenever you step out of the office stressed out, leave the problems behind in the meantime. Your home spa will heal your body and mind with its soothing ambiance. If you have not established your home spa yet, now is the time to do so. For a comfortable experience, you can count on inflatable spas. Whether you would like to have a peaceful time outdoors or indoors, it is perfect for any occasion. It also has a rapid heating feature. Just add the ambience you love and you will have an instant relaxation in the comfort of your own home. For reliable and durable home spa accessories, visit OutbaxCamping today.